The Book of Enoch is a very dangerous book, because it contradicts scripture, lies about the biblical cosmology, it declares hate for God's Temple and perverts God's mercy and plan of salvation. The Book of Enoch claims to be written by Enoch (7th from Adam), but this is false. In fact, Enoch is a collection of several books, written over periods of time (300 BC - to - 100 AD) and written by multiple authors. This means the claim that Enoch wrote the book is nothing more than a fabrication, which is why it's labeled a pseudepigraph" (Written under a false name). This alone should raise red flags about the reliability of the book. Yeshua (Jesus) showed no support for the Essenes beliefs and neither did the majority of ancient Judaism. Therefore, it needs to be asked, why would a follower of Yeshua (Jesus) follow the doctrines of the Essenes by reading their mythology in the Book of Enoch? 1. Josephus, Flavius. "THE WARS OF THE JEWS." https://www.gutenberg.org/files/2850/2850-h/2850-h.htm#link22HCH0008. Book II, Chapter 8.2-13. Josephus points out the many beliefs the Essene community held, which appear more pagan than Judeo-Christian. 2. Lightfoot, J.B. "ST PAUL’S EPISTLES TO THE COLOSSIANS AND TO PHILEMON." https://www.gutenberg.org/files/50857/50857-h/50857-h.htm#Page_158. 1875. In Chapter II, Lightfoot details Essene lifestyle and beliefs. The entire book shows how the Essenes could have been a negative influence on the early church, which Paul fought against. Copyright © 2016 All Rights Reserved. No portion of this book may be reproduced, copied, framed, published, or distributed in whole or in part without the expressed written permission of the author or publisher. You may post links to this publication to help others find the information on this website. The Book of Enoch, by R.H. Charles, 1912 is the translation used in this publication. Note: Within this publication we will use the proper Hebrew pronunciation of the Saviors name as known by the apostles, which is Yeshua, along side the common English translation of his name (Jesus). May your eyes be open to the truth, your heart willing to accept the truth, and may you be blessed with the desire to follow truth expressed by your actions. Many think the Book of Enoch is just one book. However, the Book of Enoch is a collection of books written by multiple authors and during various time periods that extend from 300 BC to 100 AD. There is even evidence to suggest that within certain single books (chapters), there may also be large gaps of time and multiple contributors (writers/editors). Therefore, it is proven and very clear that the Book of Enoch is not the work of the pre-flood Enoch found in Genesis, as the Book of Enoch implies. How is the book divided? What are the dates each book was written? - These dates are the period of time when many of the apocryphal books were written. - This period spans the time of Greek to Roman influences in the Middle East and sandwiched in between is the Maccabean revolt and reign of the Hasmonean and Herodian dynasties in Israel. - This is also the period that the mystical Jewish sect of the Essenes flourished and the Pharisee sect also gained prominence with their re-interpretation of scriptures and multitude of religious rules. Therefore, we can see a lot of political conflicts, national identity issues, doctrinal divisions, and literary activity occurring in Israel during the same period portions of the books of Enoch were written. 3. VanderKam, James C. "THE ENOCH LITERATURE." Luthern School of Theology at Chicago. http://fontes.lstc.edu/~rklein/Documents/enochlit.htm. Introductory Points, A.2, Józef Tadeusz Milik, a well-known researcher of the Dead Sea Scrolls places the Book of Parables to the third century AD, which removes any claims the Book of Enoch was prophetic. This means the Book of Parables was written after the ministry of Jesus, which makes it an even greater fraud. What language is the book of Enoch written in? The full version of the Book of Enoch is a 15th-century text or later that is only found in the Ethiopian “Ge'ez” language. Ge'ez is a Semitic language that is used for liturgy in the Ethiopian Orthodox Church, the Ethiopian Catholic Church and in the Ethiopian Jewish congregations. Fragments in Aramaic, Greek, and Latin of the Book of Enoch have been found. Scholars generally believe the Book of Enoch may have been originally written in Aramaic or Greek and later translated into the Ethiopian Ge’ez language after the 3rd century AD. In fact, Aramaic portions of the Book of Enoch are among the Dead Sea scrolls, and the Dead Sea scroll version differs with portions of the Ethiopian Book of Enoch. As stated previously, the Book of Parables (1 Enoch 37-71), was completely missing from the Dead Sea Scroll version, which is the so-called "Son of Man," or "Messiah text. This should put the Ethiopian version in question since its text also shows numerous errors, modifications, and additions. Was the Book of Parables written by Jews, Gnostics, or the Ethiopian Church years after Jesus walked the earth? That is possible and very likely. The fact that the Ethiopian church includes The Book of Enoch in their bible means very little because the Ethiopian church has a total of 81 books in their biblical canon. In fact, the Ethiopian church also includes a book titled "The Book of Josephas the Son of Bengorion," (Josippon) in their bible, which is a 10th-century work believed to based on the writings of Jewish historian Flavius Josephus. This just shows how the Ethiopian church showed little scrutiny when adding books to their biblical canon. Tertullian was the only prominent early church father that advocated for the Book of Enoch to be included among the inspired cannon of scripture. However, he was not supported in his belief, since the majority of Christianity and Judaism of the time rejected the Book of Enoch and considered it uninspired. In fact, the Book of Jude was held to be suspicious because it was thought that the Book of Jude quoted from the Book of Enoch. Tertullian only believed the Book of Enoch was legitimate scripture, because he claimed the Book of Enoch was written by the Enoch of Genesis (Which we know is incorrect), he believed it mentioned Yeshua (Jesus), and Tertullian had the belief that anything edifying was inspired by God [Chapter III Concerning the Genuineness of "The Prophecy of Enoch"]. Therefore, we can see errors in his understanding and how easily he will adopt anything uplifting as inspired scripture. This makes Tertullian's opinion about the inspiration of the Book of Enoch insignificant. The first English translation of the Ethiopic manuscript was published in 1821 by Richard Laurence, followed by additional translations written by other authors. Didn’t Yeshua (Jesus) quote from the Book of Enoch? Truth: In John 4:14 Yeshua (Jesus) was speaking of living water springing up from within a person. However, 1 Enoch is not talking about this same thing. It is more likely that the writers of 1 Enoch may have borrowed from Isaiah 12:3, 55:1, 58:11; Jeremiah 2:13; Psalm 36:8-9 and modified the concepts found in these verses. In addition, the example above and other books in 1 Enoch (The Book of Parables and The Epistle of Enoch), may have been written in the second century AD, which is long after the period of the apostles. Therefore, the Book of Enoch writers could have plagiarized concepts from Yeshua (Jesus) and the Apostles. 1 Enoch, Chapter 46 of the Book of Parables (100 BC or up to 100 AD) uses the term “Son of Man” Therefore, people assume Yeshua (Jesus) was quoting the Book of Enoch when he used that term. Truth: Many advocates for the Book of Enoch claim that Yeshua (Jesus) used the term “Son of Man” because they claim Yeshua was quoting from the Book of Parables found in 1 Enoch. However, this is far from the truth, because the term “Son of Man” was used in the book of Daniel (Daniel 7:13) and also used in Ezekiel chapter 33, which both books predate the Book of Enoch. It's more likely the writers of the Book of Enoch plagiarized from the Hebrew Scriptures or the Book of Parables was added to 1 Enoch after the death of Yeshua (Jesus). Since the Book of Parables was not found in the Dead Sea scrolls and could have been written after the death of Yeshua (Jesus), then we have the possibility that the writers of the Book of Parables (in 1 Enoch) wrote about Yeshua (Jesus) using his own words. Advocates for the Book of Enoch want you to believe that Yeshua (Jesus) and the apostles all quoted from or endorsed the Book of Enoch, but this claim cannot be proven by vague similarities to the scriptures. You will often see Book of Enoch supporters twisting scriptures to make the true scriptures support the validity of this unbiblical book. There is one writer who has a chart showing similarities between the Book of Enoch and the Book of Revelations but what they fail to mention is the fact that similarities also appear in other books of the bible, which the Book of Enoch could have easily plagiarized. In addition, several of the supposed "scriptural similarities" are far from similar in the Book of Enoch text. Therefore, whenever you see someone claim they have a side-by-side illustration of how the Book of Enoch is quoted in the bible, please take the time to verify it. What about the Book of Jude quote? “About these also Enoch, the seventh from Adam, prophesied, saying, ‘Behold, the Lord came with ten thousands of his holy ones, to execute judgment on all, and to convict all the ungodly of all their works of ungodliness which they have done in an ungodly way, and of all the hard things which ungodly sinners have spoken against him’." (Jude 1:14-15 WEB) NOTE: No mention of the Book of Enoch. Similar to, but not exactly the same as 1 Enoch. Notice: The text in Jude has to be sourced from two different locations in the Book of Enoch. Jude and the Book of the Watchers may appear to be similar and it may appear that Jude is quoting from two different books (Book of the Watchers [Enoch 1:9] and the Book of Parables [Enoch 60:8]), which are compiled within the Book of Enoch (Enoch 1/ 1 Enoch). However, in close examination there may not be the similarity between Jude and the Book of Enoch like everyone believes. Jude only said that “Enoch, the seventh from Adam, prophesied, saying…” and then quoted the Enoch prophecy. We cannot assume Jude quoted directly from the Book of Enoch because Jude never said he did and he could have quoted from any number of sources besides the Book of Enoch. Sources could have included the Old Testament scripture, oral tradition, or more likely from divine inspiration. For example, if Enoch gave an inspired prophetic word, then of course Yeshua would have known about the prophecy of Enoch and could have easily told Jude and the other apostles about it directly, or through divine inspiration of the Holy Spirit the prophetic words of Enoch could have been revealed. Why do people think Jude is only limited to the information in the Book of Enoch when much more was available? Why do people assume that a book written between (300 BC to 100 AD), which makes the false claim that it was written by Enoch, must be the original source for the Enoch prophecy quoted in Jude? Even if the prophecy in Jude is a 100% match with the Book of Enoch (which they aren't), this proves nothing except the two books probably got their information from a common source. It does not prove that this Pseudo Book of Enoch is the source. Take another look at the passage in Jude in two English translations and the passage in Enoch according to two different Book of Enoch translations. The Dead Sea Scrolls, Aramaic version of Enoch 1:9 (4Q204), states, "destroy the wicked" and is filled with even more destructive language, which is not seen at all in the Epistle of Jude. In fact, the Aramaic version has little resemblance to Jude 1:14-15. Jude says the Lord will "convince"/ "convict" all that are ungodly versus the Book of Enoch that says the Lord will "destroy" all the ungodly. Convict means to expose, rebuke, reprove, which is totally different from destroying. Therefore, we can see the message in the Book of Enoch is totally different from the message in the Book of Jude. This difference is a big deal and shows that Jude is not directly quoting from the Book of Enoch. Let's take a look at an example of just how significant this difference between the Book of Enoch and the Book of Jude really is. John 16:8 says, "When he [The Holy Spirit] has come, he will convict the world about sin, about righteousness, and about judgment"
What if we just changed the word "convict" in John 16:8 with the word "destroy"? Wouldn't that change the entire message? Of course it would. Think about it for a moment, would you rather have God come to convict you of your sins, or come to destroy you because of your sins? We're sure many of you would rather have God convict you of your sins with the opportunity to change rather than be destroyed. Well, this same difference occurs between the Book of Jude and the Book of Enoch, which means Jude and the Book of Enoch are not the same as many proclaim. So, the question the Book of Enoch advocates need to ask themselves is if Jude 1:14-15 is supposedly a direct quote right from the Book of Enoch, then how could Jude make the mistake of misquoting the Book of Enoch? Especially since Jude is writing under the inspiration of God, which would guide him in all truth and keep him from error. How did Jude make the mistake of totally changing the entire meaning of the message in the Book of Enoch by saying God will convict the ungodly when the message in Enoch says God will destroy the ungodly? Again, that's if Jude actually quoted from the Book of Enoch. The simple answer should be very clear, which is Jude is not directly quoting from the Book of Enoch and since Jude is writing under the inspiration of the Holy Spirit, that means the message of Jude is accurate and inspired, but the message in the Book of Enoch (which is different from Jude) is incorrect and uninspired. 2. The statement of Jude could have simply been based on information in the bible. Anyone can just read the scriptures and know that Enoch was the seventh from Adam. Genesis 5:1 “This is the book of the generations of Adam.”, so it's not a big mystery. There are numerous references to chariots, horses and the hosts of heaven coming to reward, to convict, and to execute judgment. This truth is not exclusive to the Book of Enoch as some want us to believe. This message is very prominent throughout the bible. Paul quotes from the Greek writer and comedian Menander [Thais 218] – “Don't be deceived! ‘Evil companionships corrupt good morals’." found in 1 Corinthians 15:33. This is a truth that is also found in scripture [Proverbs 13:20 and 22:24-25], but instead of using Hebrew scripture, Paul may have thought the Greeks in the Corinthian Church would understand the message better if he quoted from a pagan Greek writer they may have been familiar with. Paul quotes from a pagan scientist, philosopher, and poet named Aratus – “'For in him we live, and move, and have our being.' As some of your own poets have said, 'For we are also his offspring. '” found in Acts 17:28. This poem was actually used for praise to Zeus, but Paul used it to teach about the true God. Paul quotes Epimenides, another pagan writer in Titus 1:12: “One of them, a prophet of their own, said, "Cretans are always liars, evil beasts, and idle gluttons." Is this statement about all Cretans biblically true? The current population on the Island of Crete is about 624,000 people, so are we to believe that all 624,000 of these people are always liars, evil beasts, and gluttons? It's more likely Paul was using this pagan prophet to make a point. So, the question we need to ask is should these pagan writers be considered "God inspired"? These pagan writers are quoted in the Bible by the Apostle Paul, does that mean we should make all the works of these pagan writers inspired? Should we put all their pagan poems, prophecies, and writings in the Bible? The answer to all these questions is absolutely not. However, people don’t share this common sense when it comes to the Book of Enoch. Some think that just because the Apostle Jude supposedly quotes Enoch 1:9, then that means the entire Book of Enoch is inspired. If this principle was used with Menande, Artus, and Epimenides, then our bible would be much larger and filled with many pagan teachings that would introduce strange doctrines in the Bible. Secular works (Poems, music, books, and movies) could be used to help people understand a biblical principle, but it does not make these pagan works inspired and worthy of inclusion in the Bible. If someone uses the Lord of the Rings as an analogy for the biblical fight between good and evil, that does not make the Lord of the Rings a new biblical book that needs to be added to the canon of scripture. Just because Jude supposedly quoted a few concepts or sentences from the Book of the Watchers, which is found in the larger collection of books called the Book of Enoch 1, proves absolutely nothing. Keep in mind that the writings of the pagan philosophers that the Apostle Paul quoted does not mean the pagan writers or all the writings of these pagans Paul quoted from were inspired. Paul was just using a secular work to illustrate a biblical principle or to prove a point. Even if Jude did quote from the Book of Enoch 1(which we don't believe he did), that in itself does not make the entire Book of Enoch an inspired truth worthy of being included in the Bible. In fact, some believe Jude may have simply used this supposed quote from Enoch 1 (a Jewish fable) to actually refute false teachers and to warn them of the judgment and wrath of God to come against them. Again, this scenario is only if Jude actually quoted from the Book of Enoch, but we believe the Book of Enoch gives an opposite message from the message of Jude. If Jude by inspiration stated that Enoch the seventh from Adam prophesied by inspiration then we must truly believe Enoch actually did speak those things. However, just because Enoch 1 makes the same claim as The Book of Jude about Enoch, this in itself does not make the Book of Enoch 1 an inspired writing. This is especially true when we can see many passages of Enoch 1 go against truly inspired scripture. As stated previously, Paul used secular sources in his inspired writings, but he never endorsed all of the writings of those secular sources nor did Paul claim them as inspired. The Book of Enoch and other similar books may have been popular books during Second Temple period, but this does not mean we should adopt them as accurate text or fully inspired writings either. As we will see later, the Book of Enoch was full of colorful stories that make it less of an inspired book and more of a fable, which Paul under inspiration told us to avoid. Jewish Fable - The Greek work "Mythos" (fables) can be defined as a story that's pretending to be true or a fable that undermines or attempts to replace the truth. This publication will show you evidence of how the Book of Enoch fits this description. Examples will be provided showing how the Book of Enoch introduces ideas that run counter to the scriptures while pretending to be the legitimate work of Enoch mentioned in Genesis. People who accept this work as equal to biblical truth need to heed the advice of Paul: "...Reprove them sharply, that they may be sound in the faith, not paying attention to Jewish fables..."
The canon of Old Testament scripture was confirmed long before Yeshua (Jesus) arrived and even Yeshua himself confirmed [Matthew 23:35, Luke 24:44] the canon of Old Testament scriptures was in place. In addition, the early church and early historians confirmed the Old Testament canon we have now is accurate. Revelation 9:20, 16:9 and 20:4 all show that sinners during the Tribulation will always have an opportunity to repent, to resist evil, and follow righteousness. God will still offer mercy and salvation during the Tribulation. Therefore, the Book of Enoch contradicts scripture. The ancient Ell was originally the same as a cubit, which is a measurement from elbow to fingertips (Approx. 18 inches). Today an Ell is about 3.5 feet. So, if we go by the older, smaller, measurement of 18 inches, then 3,000 Ells are equal to 4,500 feet. There is another translation of the Book of Enoch written by Richard Laurence, which claims the Book of Enoch only says 300 Ells, which would make the giants 450 feet. Either way, the heights of the giants in the Book of Enoch are not scriptural and physically impossible. According to this verse of scripture, the bed of King Og was 13.5 feet long. Therefore, some estimate King Og was about 11 feet tall. Giants in the scriptures are recorded to be around 9 to 11 feet in height. In no way do the scriptures ever support the possibility of a 4,500 or 450 foot giant that the Book of Enoch claims existed. Noah’s Ark was 300 cubits (450 feet) long, so according to the Book of Enoch, the world had giants that were equal to or ten times the size of Noah’s Ark. This is totally ridicules. The Book of Enoch attributes all sin in the world to Azazel, a fallen angel, but this is contrary to scriptures which say all sin entered the world through Adam. Therefore, the Book of Enoch contradicts scripture, because it is wrong about who is responsible for all sin in the world. According to Daniel 9:24 this was not the mission of Michael the Archangel, but Yeshua (Jesus), who would put an end to sin. Enoch 10:20-21 is a false teaching that contradicts scripture. Genesis 6:5 states, "And GOD saw that the wickedness of man was great in the earth, and that every imagination of the thoughts of his heart was only evil continually." After the Ark settled on dry land we see that God made the same assessment of mankind: "for the imagination of man's heart is evil from his youth." Genesis 8:21. So what changed? Mankind had a sinful nature before the flood and also after the flood. Therefore, the statement of Michael the Archangel cleansing the earth of "godlessness" and the children of men shall become righteous (according to the Book of Enoch) is false and debunked by the bible. Angels cannot be the source of true salvation. If angels could make men righteous or cleanse the earth from sin then there would have been no need for Yeshua (Jesus) to die on the cross. The Bible makes it clear that there is only one way to salvation and righteousness and that way is only through Yeshua (Jesus). This teaching in the Book of Enoch is counter to the teachings of scripture. In the Bible, you will never read about a human transforming into a “siren.” The siren was a pagan, mythical, creature that took the form of a half woman and half bird that lured sailors into danger with their singing. It was also believed that these siren creatures may have been cannibals. The Book of Enoch states that human women will actually transform into these pagan mythical creatures. This proves the Book of Enoch promotes pagan mythology and attempts to introduce these mythologies into the biblical account of human history. This makes the Book of Enoch a dangerous book. This passage is very weird and implies the elect and holy children will come down from heaven in the last days with their “seed” (children) and the children will become one with the children of men. There is no scriptural support or prophetic word about this ever occurring in the future, nor is there any mention of the holy elect having children in heaven. This contradicts the Bible. Yeshua (Jesus) said: “…Every kingdom divided against itself is brought to desolation, and every city or house divided against itself will not stand.” (Matthew 12:25 WEB). Therefore, the Kingdom of God cannot be divided as the Book of Enoch claims. This is a contradiction of scripture. “And there I saw the mansions of the elect and the mansions of the holy, and mine eyes saw there all sinners being driven from thence which deny the name of the Lord of Spirits, and being dragged off: and they could not abide because of the punishment which proceeds from the Lord of Spirits.” Enoch Chapter 41:2 – Written 100 BC to 200 AD. However, nowhere in the scriptures do we see sinners dwelling in heavenly mansions of the saved and being evicted from these mansions. The Book of Enoch contradicts scripture and teaches fables. The wording in the above posted portions gives the impression that Yeshua (Jesus) is nothing more than a man who was selected before the earth was created-- This is all incorrect. Yeshua (Jesus) is God and not a creature of God. For anyone who doubts his divinity we recommend they read: Is Yeshua God? Yes and the bible proves it! by Shofar Productions (Click Here). The bible clearly teaches that Yeshua (Jesus) was not just a man, nor was he an angel, and he was not a special creation. Yeshua (Jesus) always existed with the Father, because Yeshua (Jesus), with the Father, and the Holy Spirit are God (Yahweh). The thing we also need to keep in mind is that the entire Book of Parables (at best) may have been written during the 1st century AD. Therefore, any similarity to Yeshua (Jesus) may be based on the fact that the writer(s) were familiar with him and the stories about him. However, since the Book of Parables was never found in the Dead Sea Scrolls, and since all we really have to go by is the Ethiopian text dated in the 15th century or later, then the more likely conclusion is that this text originated from or was revised by Christian writers/editors. This appears even more likely considering the Ethiopian text has many corrections and editions. Nevertheless, the message is still contradictory to the Canon of scripture accepted by the majority of Christianity and Judaism. The book of Enoch teaches a different truth from the Bible. Is the Book of Enoch trying to say that God is requiring the shedding of human blood for a sacrifice? Enoch implies that the blood of Yeshua (Jesus) was not sufficient to the Father and that human blood is now required. This teaching is blasphemy. “…We have been sanctified through the offering of the body of Jesus Christ once for all…but he, when he had offered one sacrifice for sins forever, sat down on the right hand of God…for by one offering he has perfected forever those who are being sanctified…For if we sin willfully after we have received the knowledge of the truth, there remains no more sacrifice for sins.” (Hebrews 10:10, 12, 14 and 26 WEB) This means Yeshua is the final offering and there is no other required. The Book of Enoch clearly states that “the blood of the righteous [has] been REQUIRED before the Lord of Spirits.” This implies God mandated an offering of righteous blood. This is scripturally wrong because Yeshua (Jesus) is all we need for salvation and the blood of Yeshua (Jesus) is the only offering the Father once and for all. “…Christ also suffered for sins ONCE, the righteous for the unrighteous, that he might bring you to God, being put to death in the flesh, but made alive in the spirit.” (1 Peter 3:18 WEB) The book of Enoch is introducing a doctrine that is counter to the word of God. Is God going to choose the righteous and holy from hell? No! This is not scriptural. The Bible makes it clear that hell is a holding place until the final judgment of the sinful. The Book of Enoch is completely in error saying that those in hell will be chosen “from among them: for the day has drawn nigh that they should be saved.” This is giving false hope that those in Hell have a second chance at salvation. This is not scriptural at all! There is no mention at all of God instructing angels to build the Ark. However, we do have clear biblical instructions that the building of the Ark would be a human effort in obedience to a commandment from God. This was an act of faith on the part of Noah to build the ark in order to save his family and selected animals. "But with thee will I establish my covenant; and thou shalt come into the ark, thou, and thy sons, and thy wife, and thy sons' wives with thee". (Genesis 6:18) - Not only was Noah involved, but so was his wife, sons, and daughters-in-law. The Book of Enoch robs this biblical illustration of faith and obedience by making the false claim that God told Noah angels were already working on the Ark and would complete it before the flood. If angels built the Ark, then there was no act of obedience or faith required from Noah, which then makes the statement of Hebrews 11:7 false. However, Hebrews 11:7 is inspired scripture, which makes its statement true and the teachings of the Book of Enoch false. Clearly, the Book of Enoch is teaching things that are contrary to scripture. Helios: He was the personification of the Sun in Greek mythology and in Roman mythology he was named "Sol". Helios/Sol, rode his Sun Chariot across the daytime sky drawn by four fiery steeds. Selene: She is the personification of the Moon in Greek mythology and in Roman mythology she was named "Luna". Selene/Luna, rode her Moon Chariot across the sky drawn by two horses. The Stars: Greek and Roman mythology also view the stars as charioteers riding the night sky, which is also seen in the Book of Enoch. See the Book of Enoch 75:8: "And I saw chariots in the heaven, running in the world, above those portals in which revolve the stars that never set." You will also find similar mythology in older cultures or in cultures around the world. For example, in Hinduism, you will see their Sun God riding in a chariot. In the Nordic culture they have a Sun chariot, and in Celtic cultures, they have Taranis, which is their god of thunder, the sky, and the sun. Taranis is also associated with the chariot wheel. Therefore, we can see this same mythology in just about every culture and clearly included in the Book of Enoch. Obviously, none of this is biblical. Yet, the Book of Enoch claims this is how the Sun and Moon operate in our skies. Keep in mind that this teaching in the Book of Enoch is not meant to be a poetic illustration. In fact, the Book of Enoch claims this information about how the Sun and Moon go across the sky in a chariot, was actually knowledge given to Enoch from heaven (See chapters 79, and 80:1). However, how could that be true when we King Josiah destroyed the dedication and symbolism of the Sun Chariot? In 2 Kings 23:11, we see king Josiah eliminating this same form of Sun (Helios) dedication from Israel: "And he took away the horses that the kings of Judah had given to the sun, at the entering in of the house of the LORD, by the chamber of Nathanmelech the chamberlain, which was in the suburbs, and burned the chariots of the sun with fire." So, why would the angels of heaven supposedly teach Enoch these same pagan mythologies? Clearly, the Book of Enoch is teaching false doctrines. The Book of Enoch would like you to believe that these Sun and Moon entities really do exist and to add even more heresy, the Book of Enoch wants you to believe these are all teachings from heaven, which is 100% false. Mary and Joseph took Yeshua (Jesus) to the Temple to fulfill the required sacrifices (Luke 2:22-24). It was at the Temple that Mary and Joseph received inspired prophetic words about Yeshua (Luke 2:25-38). It was every year that Joseph and Mary went up to the Temple to celebrate the feast days (Luke 2:41-42). Yeshua (Jesus) cleansed the Temple and said “…My house shall be called a house of prayer…” (Matthew 21:13 WEB), thus Yeshua confirmed the Second Temple was God’s house. Yeshua (Jesus) said that God dwells in the Temple (Matthew 23:21). Yeshua stated the altar makes the sacrifice sacred (Matthew 23:19). Yeshua also taught many times in the Temple and to be completely observant of the Torah he would have also offered the required sacrifices at the Temple. Therefore, since Yeshua and the disciples taught in the temple, sacrificed in the temple, and worshipped in the temple, then we can conclude they would have refuted the Book of Enoch, which spoke wickedly about the Second Temple and the sacrifices of the altar that God considered holy. This is a look at the entire 106th chapter of the Book of Enoch. This chapter is full of biblical error and very weird events that show the Book of Enoch is a Jewish fable that Paul warned us to stay away from (Titus 1:14). For the sake of space, we will just provide a brief summary of the context of this chapter with some quotes and followed by commentary on the chapter. This chapter talks about the birth of Noah and gives a very strange description of the infant. According to the story from the Book of Enoch, Lamech was frightened of his son and thought that the infant Noah was not human. None of this is even hinted at in the Bible. Noah was very human, and did not have laser eyes. The next passage from chapter 106 in the Book of Enoch is very heretical. It describes how Lamech urged his father Methuselah to go and speak with Enoch (who had been translated into heaven) for answers about Noah. We then see that Methuselah went to the “ends of the earth” and cried out for Enoch. Enoch then said: “Behold, here am I, my son, wherefore hast thou come to me?” Methuselah gives Enoch a description of the infant Noah and his strange attributes. Enoch follows with a description of the coming flood and how Noah and his future sons will be saved from destruction. First of all, Genesis 5:24 says: “Enoch walked with God, and he was not, for God took him.” Hebrews 11:5 says: “…Enoch was TAKEN AWAY, so that he wouldn’t see death, and HE WAS NOT FOUND, because God translated him…” According to scripture it would be impossible for Methuselah to go to the “ends of the earth,” and yell for Enoch and for Enoch to come back to earth to give Methuselah the answer he wanted about Noah. This story is clearly a heretical fable. Secondly, Enoch was translated 69 years before Noah was born, but the book of Enoch often tells of discussions and interactions between Noah and Enoch (Chapters 65, 106, 107, and more). In fact, Chapter 65 tells the story of how Noah went to the “ends of the earth” and cried out to Enoch and asked Enoch what was going to happen on the earth. Enoch talked to Noah and even took Noah by the hand. This once again shows that the Book of Enoch is contrary to scripture and introduces false teachings about events that never happened. 1. The only full text of the Book of Enoch comes from the Ethiopian text, which are dated from the 15th-century or later and shows errors, modifications and additions. The Aramaic text found in the Dead Sea Scrolls are not in full agreement with the Ethiopian text and the entire book of Parables is missing, which may indicate this section was a later edition made to the Ethiopian Book of Enoch. 2. People claim there are similarities between the Book of Enoch and the true scriptures but often many of these so called "similarities" prove to be false. 3. The Epistle of Jude has a totally different message from the message found in the Book of Enoch, thus proving Jude did not directly quote from the Book of Enoch. 4. The Book of Enoch claims sinners will find no mercy nor will they find salvation during the tribulation. This is a false statement because the Book of Revelations shows sinners will have the opportunity for salvation during the tribulation period. 5. The Book of Enoch makes the outrageous claim that human women gave birth to 450-foot giants. 6. The Book of Enoch contradicts scripture by saying all sin in the world did not originate with Adam, but from a fallen angel named Azazel. 7. The Book of Enoch claims angels can cleanse the earth of all sin. This is counter to scripture and the message of the Gospel and makes the Book of Enoch heretical. 8. The Book of Enoch states that the human women who had sexual relations with fallen angels and gave birth to giants will also be transformed into mythical creatures known as “sirens,” which is the promotion of pagan teachings. 9. The Book of Enoch states that in the last days the children of the holy elect will come down from heaven to be one with the children of men. This is another strange concept that disagrees with scripture. 10. The Book of Enoch once again contradicts scripture by saying the Kingdom of God is divided. 11. Yeshua (Jesus) stated he was going to heaven to prepare a mansion for the righteous, but the Book of Enoch says sinners must be evicted from the heavenly mansions first. 12. The Book of Enoch denies the deity of Yeshua (Jesus), but the bible teaches that Yeshua (Jesus) as a member of the Trinity (Godhead). 13. The Bible says Yeshua (Jesus) shed his blood as the final sacrifice, but the Book of Enoch says God will still require a certain number of righteous to shed their blood as an offering required by God. 14. The Bible says those who are in hell will be cast into the lake of fire, but the Book of Enoch says that God will choose the righteous and holy from hell. 15. The Book of Enoch teaches that only the angels built the Ark, but the scriptures say Noah and his family were involved with the Ark. As a sign of his obedience and faith to God, Noah took the instructions of God and completed the Ark. Angels are never mentioned as the builders of the Ark. 16. The Book of Enoch teaches pagan mythology, by claiming the Sun and Moon are beings that ride in chariots across the sky. Then the Book of Enoch adds further heresy, by stating this knowledge of the sun, moon,and the cosmos were given from heaven. 17. The Book of Enoch speaks wickedly about the Second Temple and the sacrifices, which God considered holy. 18. 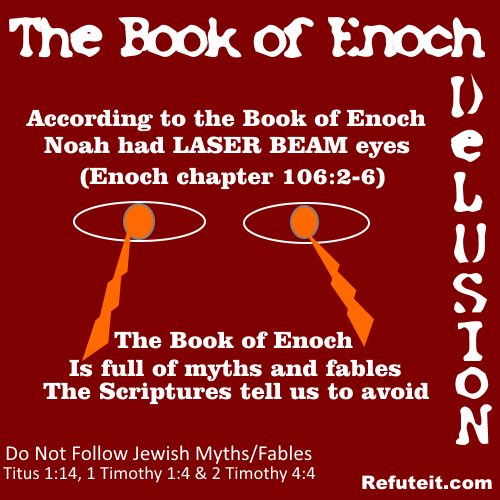 The Book of Enoch says that Noah’s father was fearful of Noah when he was born because Noah did not appear human and had eyes like laser beams that illuminated the entire house. In addition, the Book of Enoch says that Noah and his grandfather Methuselah were able to speak to Enoch from the edge of the earth and that Enoch appeared when summoned to shared secrets from heaven. Not only does this contradict scripture, but it appears to be very pagan, or like occult teachings, which is probably why many in the occult support this book. 20. These examples just scratch the surface. The Book of Enoch is filled with biblical contradictions and very strange accounts about the heavens, earth, humans, and angels. The Book of Enoch reflects a lot of pagan beliefs, which clearly shows it’s uninspired. This is why the Book of Enoch was rejected as scripture by both Christians and Jews, with the exception of Jewish and Christian sects in Ethiopia, or a handful of early church leaders. However, those who embrace the Book of Enoch cannot produce valid evidence for its inspiration, but there is ample evidence to prove the book contains dangerous false teachings. What are the dangers of using the Book of Enoch? The Apostle Paul said all scripture is inspired by God and is profitable for establishing doctrines (2 Timothy 3:16), but the Book of Enoch is contrary to scripture and proven to be uninspired. Therefore, we can never use the Book of Enoch for teaching or for doctrine. To the biblically ignorant the book of Enoch might be appealing, but those who know the scripture will find the Book of Enoch full of false teachings, blasphemy, and heresy. You can chose to ignore the instructions of the Apostle Paul, and continue to use “Jewish fables” (Titus 1:14) like the Book of Enoch as your proof text for teaching and developing doctrines, but this means you are teaching and developing beliefs based on false information. The Book of Enoch is full of mystical overtones, and some text in the Book of Enoch may sound similar to the scriptures, but this does not make it scripture. Therefore, our advice is that everyone should keep away from the Book of Enoch and instead of promoting it, believers should REFUTE IT!! !